Ken Gonzales-Day, two men were found on a tree, 2005, chromagenic print, 39 1/2 x 72“. 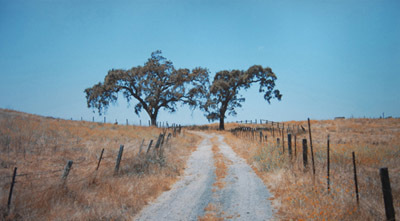 From the series ”Searching for California’s Hang Trees," 2005. By writing off summer group shows as low-season rummage sales for leftover stock, one risks missing out on adventurous curating and the testing of new talent. “Past Over” at Steve Turner Contemporary features six artists (and one collective) who range from relatively unknown to firmly established. The gallery’s inaugural outing, the exhibition is thematically tight and full of discovery. The works are daring and diverse, but they all divulge dirty secrets that have been sanitized by dominant historical discourses. Following the lead of the Truth and Reconciliation Commission in South Africa, Mary Kelly’s Johannesburg, 1999, excavates the experiences of women and children under the apartheid regime. Kelly renders their testimony in a long, wavy horizontal stretch of text formed from a flimsy but stubborn substance: lint. Michael Arcega’s darkly comic sculptures—a cathedral made from petroleum-based plastic and titled at a perilous angle (In Gaud We Trust, 2006), a suit of armor made from manila folders (Conquistadorkes II, 2006)—give Spanish colonialism the archaeological treatment. Unearthing a pagan community that embraced Native American culture, a pair of Sam Durant’s photographs from the “Merry Mount Photo Series,” 2006, depict exhibits from the Plymouth National Wax Museum in Plymouth, Massachusetts, that were discarded when the museum closed down. The congealed figurines in Durant’s pictures have been cast aside twice—by a defunct institution and by the pilgrims who pushed the community into extinction. They resurface like ragged, reproachful corpses. Equally haunting are Ken Gonzales-Day’s large-scale photographs. From the series “Searching for California’s Hang Trees,” 2005, they appear, on first glance, to be striking, color-rich landscapes. In reality, they document the present-day sites of turn-of-the-last-century lynchings.